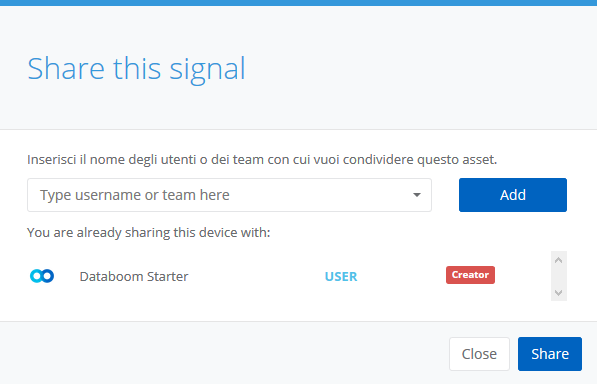 The sharing feature allows you to make your own signal accessible to other users and teams. To share a signal it is enough reaching its details and clicking the Share button. The window that opens shows the current shares, you can add both registered users or email addresses of users you want to invite to Databoom. The actual sharing happens by clicking the confirm button. A new share has default Viewer permission and the history has receiver user's restrictions. From the share modal it is possible to enable the Make Admin option that directly assigns admin permissions to the receiver. Once sharing is enabled, the users with access to the signal will be displayed in the dedicated section at the bottom of the details page. The buttons allow you to remove the share or choose the type of permissions to assigne to the user. If the user is the creator of the signal, it is possible to Share history. Default share lets the receiving user view data depending on his/her Databoom plan and could have restrictions. By sharing the signal history from the panel in the bottom of the signal page, it is possible to give the selected user the same signal view of the creator.